I kind of gave up on Blogger in 2008. Too often, it made photos ginormous during import, gave me coding error message when I hit ‘publish’ and would delete photos if I tried to move them by copy and paste vs. dragging and dropping. So, I found out I could import my blog in its entirety to WordPress and I’ve done it. Plus, I can get that cool ‘possibly related posts’ thing going. Comments from Halsoscan and JS-Kit didn’t come with me, but this JS-Kit conversion was a colossal PITA anyway and I still have access to them on the Haloscan site. If you want a little avatar by your comments, just register at Gravatar.com. It works with WordPress and with folks on Haloscan. I was told recently by a good friend that I dress like I work at an advertising agency. I took it as a total compliment and this skirt will not do anything to take away from that impression! I LOVE this skirt. It’s been a while since I have been head over heels for a project design. Truly. Normally I love something because of the fit and fabric. Not often is it the design that makes me giddy. But, this skirt is the coolest thing since sliced bread. The fit took a lot of tweaking, Knip Mode seems to have more ease that BWOF. And I put just about every piece on backwards, upside down or before behind during construction, so there was a lot of stretching at the seams since much of this is bias cut. So, they are not as straight as they could be. I first saw this skirt on Sigrid’s blog and fell in love. Thanks to her, I have about a year’s worth of KMs (most of which are with Trena at the moment). Unbuttoned, you can see that this is a basic wrap skirt. The wrap over piece is cut on the bias with loads of drape and curve to create the pleats when buttoned. The skirt design is unlined, but I chose to fully line it. I wanted that peak of color you can see below, a firmer drape and stabilisation behind the buttonholes (I did samples. The buttonholes were all wonky without the lining). I also conquered my fear of the blind hem attachment last night! I could not see myself doing all this hand hemming. What a little miracle that stitch pattern and foot are. The skirt is shortened by about 3 – 5 inches. 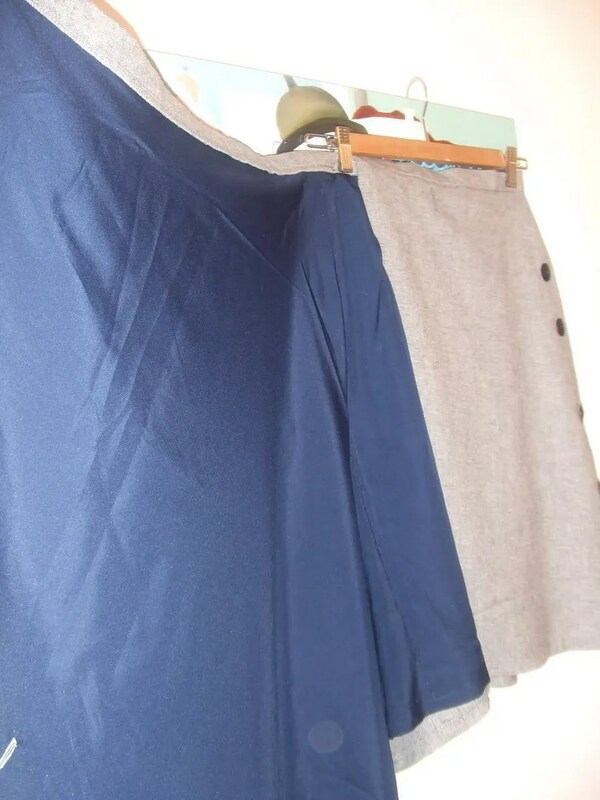 I know this is similar to the ‘Stitch’ skirt, but on the KM version you don’t see the buttons, the pleats are symmetrical and there is waistband. I think all that makes it more professional. I’d like to work on a simple black knit top to wear with it. But, the fabric I want has gone missing in the house. I’ve done a hard search four times today and am giving up. And HA! 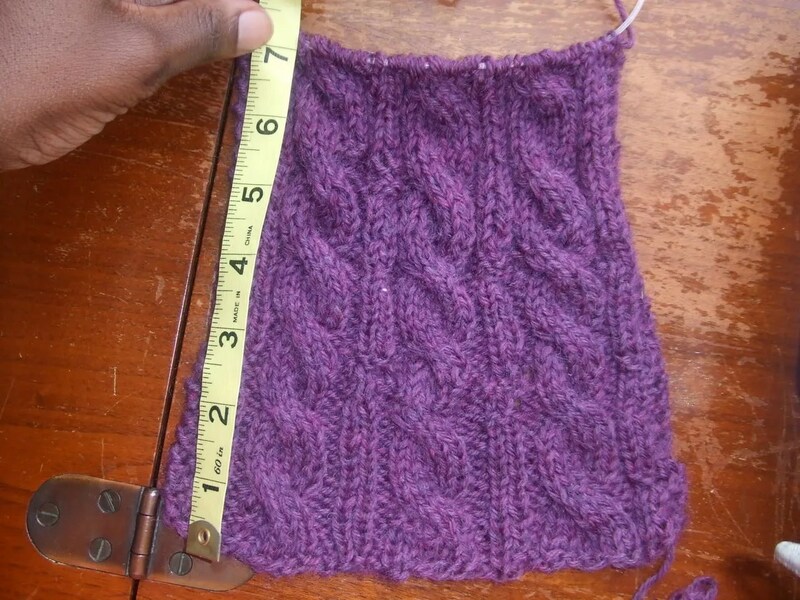 Here’s how far I’ve gotten in a week on my scarf. Remember, a week ago I ripped it out and started over. I’m back to where I was! Don’t be surprised if this becomes a cowl. A scarf is a lifetime of knitting! Nice skirt! You look good. PS. Have you seen the links on David Page Coffins website for making ties? I LOVE your skirt!. I stumbled on your blog about a month ago (though pattern review) and have been totally inspired to try sewing for myself. Thank you so much. The skirt looks so cool from behind! That skirt is so fabulous! I hope you enjoy your new home! 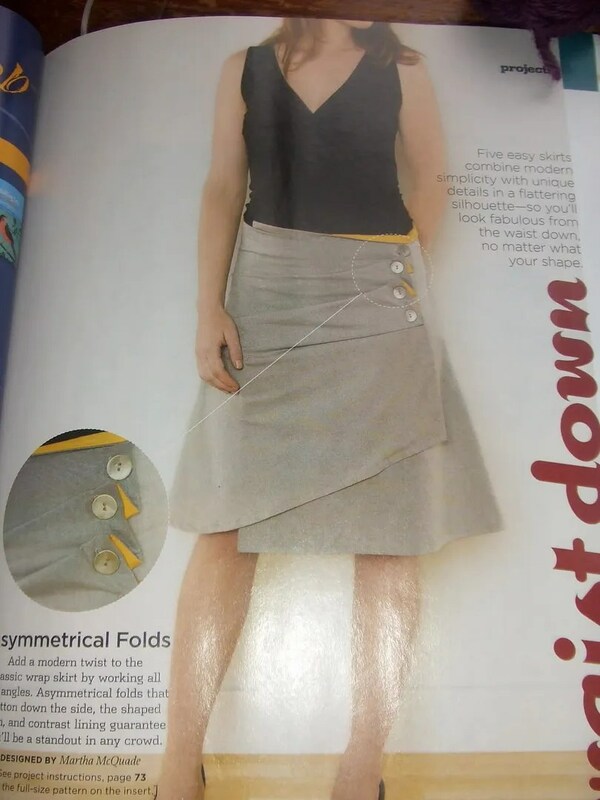 That is just THE most flattering skirt- absolutely to die for. Congrats on the move to wordpress. I’m still stumbling around on blogger, my web mac was so much easier but didn’t come with too many features. I’m a mac-forever person and if they ever make a REAL blogger program I’m there. Too bad you’re far away from Chicago but if you plan a visit just let me know. What a great skirt! At first I thought it was the one from In Stitches but I really like this version a lot. Definitely looks really nice and polished. Great skirt! I think it really suits you and looks perfect with the top you have on. That skirt is fab-you-luss! I had no idea it involved all those buttons, I haven’t taken a close look at the skirt in Stitch mag yet either. I like the new blog and I’m off to subscribe to the new feed right now. Your skirt is truly fabulous! What a cute skirt, Cidell. You do have the best clothes, great job. Awesome skirt! It looks fantastic on you. WOWOWOWOW. That skirt is completely FABULOUS. That is a super cool skirt, I love it! Anyway…the skirt really looks like you and I’m liking it on you! Hope you find the black fabric soon! Love the skirt, and I would say you also look like you work in publishing, which is a compliment too. I don’t typically have problems like yours in Blogger, but I find writing in the HTML mode makes things easier. Cidell, seriously though, when are you going to get your own domain name?! That skirt is totally cool! You look great! The skirt looks wonderful on you, what a neat design. The scarf is looking good also, just keep at it ! Great skirt! Looks fantastic on you. Score! The skirt is fab and very flattering on you!!! It looks better than the model’s from Knip Mode. I love, love, love this skirt. At first I did think it was the skirt from Stitches. But this one has a lot more going for it. I always enjoy seeing what you have created. You are such an inspiration to a newbie seamster like myself. Kudos to your move to WP. I have used a WordPress.org account for the last 3 years or so and really love it. I think that you will really enjoy the versatility that this CMS can offer you. I love your skirt. Thanks for the layout so I could see how it does what it does. Um, I’m dying. That skirt is fabulous. Even before you mentioned the similarities to the one in ‘Stitch’ I thought to myself that it looked similar yet cleaner. Thanks for showing us the construction. It shouldn’t be too hard to make even without the pattern, hopefully. Gah. Looks great. Love your skirt – it is smashing! Stay with the scarf…I made that same Irish Hiking Scarf two years ago. It does seem like it takes forever, but you’ll be so glad you stuck with it when you’re done – and you will have a classic scarf that won’t go out of style. I want that skirt! I absolutely love it! Sweet skirt! Welcome to your new home. It is a unique design and I really like it on you! Thanks for showing the wrap unbuttoned. I sat up in my chair and leaned into the screen to admire (inspect) it more closely. Wow! I LOVE the skirt, and your blog. I’m from Baltimore, live in CA, can’t wait to move home! Thanks for the purple Ravens pics! Cool skirt!! Thanks for revealing the skirt’s ‘magic’ too. I wouldn’t have worked it out, but it’s rather simple when you see it unwrapped plus the pattern pieces. Quite ingenious. OMG! This is incredible. I was lusting after the Stitch skirt but I think I like this one more. Great job! Your new skirt is GORGEOUS! I love it! Great Design! Love your version of the skirt. It’s great with the black top. Great that you could take your blog to WordPress and keep all your entries. I love this skirt! Thank you for revealing the magic behind it! That skirt is überfabulous, looks sooooooooo good on you. Can I just say you are one crazy knitter! Or maybe brave, knitting cables for your first project?!? The skirt is beyond gorgeous! I have the Stitch skirt pattern and plan to make it but your Knip Mode version looks even better! Great skirt! I love it, too. I love that skirt! It looks great on you and is so unusual. I hope you like your new virtual home. That skirt is fab. Takes a lot of personality to pull off such a distinctive look, but you are wearing that skirt! You always looks so put together in your work clothes. I hate change – I’ll be fine when I get used to it. There are few sites that I sort of ‘live’ on, yours is one, PR message board, GFY and aDaD. So I’m going to sulk while you get the hang of this ;-). NOT liking the grey background, I hope you’ll be able to import your cool pattern background or something equally you. Also not liking that the blog list doesn’t show latest posts, just a list. Yes, I know, I need to get my own bloglines or whatever working, but I can’t figure it all out. And you know all the best people! Your knitting is coming along, scarves do take time, but it looks nice wool to work with. You are doing great! You’ll get it finished for winter. Just don’t tell WHICH winter!! I LOVE that the skirt looks all corporate from the back, then “art deco” in the front. I should definitely make a Jan 12 resolution that I will sew more wow items this year! 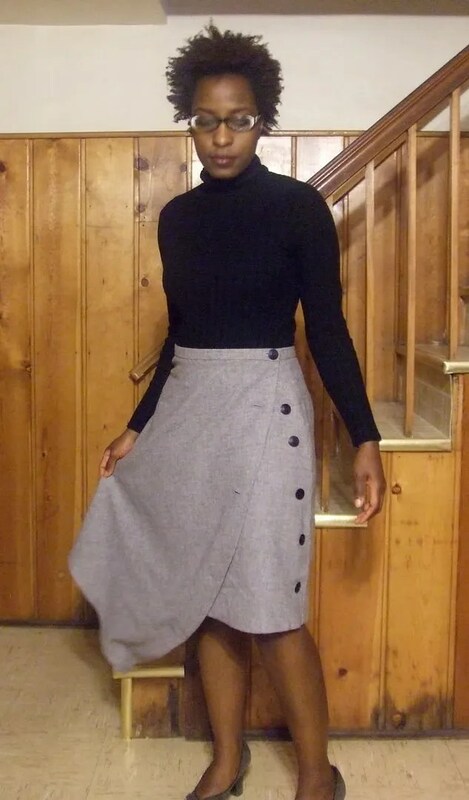 I like the new blog and the skirt. 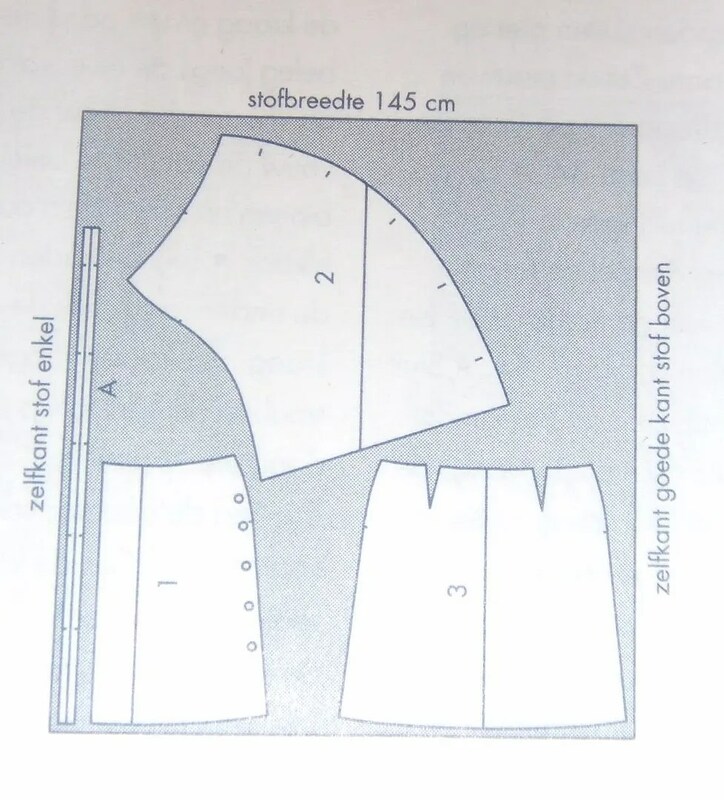 At first glance I thought you had made the skirt from Stitch, only because that is the skirt I’m working on and apparently I have a one track brain these days. I agree, the KP skirt is much more professional looking. It looks awesome on you. And both your friend and you are right concerning your wardrobe! Definitely a compliment! A fancy front and the back still doesn’t make your behind look like the broad side of a barn! Now that is cool! What a great skirt! Fantastic job! I DO LOVE that skirt. I was thinking about making the stitches one until I saw this. Meh, maybe for summer anyway. Nice new look to the blog, but now I have to update my link. What a cool skirt. I’ve never seen anything like it. I love this skirt — nice job on constructing it! It is such a cool design, and much more polished than the Stitch mag cover skirt. I need to make this one! That skirt is “ta-da”. Loving it. LOVE this skirt. Which knip mode is it from? I’d like to track it down. Congrats on the move! And that skirt.. I totally LOVE it.. now I have to find that magazine.. or make it up myself! I loooove it. This skirt is FA-BU-LOUS!!!! Truly TDF!!!! Well done Cidell!!! Interesting design! I like it very much. Your knitting is coming along really well, that scarf will be beautiful when it’s done. I’m thinkking of doing one of these too-must find just the right yarn. The knip skirt is way better than the one from Stitch, trust me. That skirt’s amazing! And your move has me learning words like Avator, etc. What’s the “cool ‘possibly related posts thing”? on WordPress? Congrats on the new blog and cute skirt. One problem I did note though, your pictures seem to be *huge* (filesize wise) as they take forever to load and I’m on DSL. You’re right, I absolutely *must* get to that skirt soon!!! It’s gorgeous! I’m completely inspired by your work! Great job on that skirt. Welcome to your new blog! And hi from Brussels. I too find Knip Mode has more ease than BWOF and it shows Dutch aesthetic in preference for more sporty, tomboy looks. Unfortunately their sizes run a little bigger than BWOF so a lot of them stop at 38, which is a little bigger than a BWOF 38. Heyyyy! I just went over to KM’s site and their February issu says that KM has done an overhaul, and from now on everything will be offered in 7 sizes (yeah!) and the pattern paper will be whiter and easier to read. Presumably they will be printing with more pattern sheets as they are expanding the size range, clarifiying the pattern pages, and the preview seems to show they didn’t offer less styles. Oh this is good news! I wish they would make the paper BIGGER! That skirt is fabulous on you! Tres chic. Your skirt is simply a work of art. I love the buttons and the draping folds. Well done! What a fantastic skirt! Are you going to make a jacket to go with it? What a great suit it would make. I love the skirt! O MY! You can import your entire blog? Um, I’m sorely tempted. I get so irritated at blogger’s limitations with photos, etc. GREAT skirt. I’ve been wanting to do the Stitch one, but now I want that KM. Crap. Congratuations on the move. I’ve been considering moving my blog to another platform as well for all the same reasons that you expressed. Girl!!! That skirt is a knock out! You looked so chic, so fabulous! Change is great, I hope wordpress will be up to your expectations! Now this skirt is fabulous, I love it!!! I might be a bit presomptuous but like loopylulu I feel it shouldn’t be too dificult to draft… Thanks for sharing the layout and construction. I really like the skirt and it is similar to the one in Stitch Magazine. Not only does the Knipmode have a more professional look, but has an interesting look as well. I found your blog via your Simplicity 4237 pants. They are fantastic! Can you please tell me what kind of fabric you used. My sister gave me a hand me down jacket that would go great with some current Anthro pants that look like this. I found a similar pattern at HotPatterns, but the price is right for simplicity! Whew! I thought I lost you. When you said you would keep the other site up for a month, I thought I would have to time to move some of my favorite entries to a folder. Went back yesterday and it was gone. Could not remember new site name. Had to google you, “Cidell Baltimore” and there you were! I enjoy your blog so much and look forward to new posts. So glad you moved to WordPress; no matter what I did (scripting enabled! ), I wasn’t able to either view or leave comments on your old site. What was up with that? Your skirt is wonderful — love the professional look combined with that oh-so-individual glimpse of lining. It’s the best of both worlds! You already know how much I love the skirt. But I also wanted to let you know that I nominated you for a Kreativ Blogger award. I’ve been dreaming about this skirt eversince you posted and now I’m getting ready to make it up. One question, though: is your lining bagged at the hem or did you hem the lining and fashion fabric separately? Thanks for your help! Hi! No, the lining isn’t bagged. It’s hemmed seperatly from the skirt. But, sewing along the button side and understitched. It works with WordPress and with folks on Haloscan. Normally I love something because of the fit and fabric. Not often is it the design that makes me giddy. The wrap over piece is cut on the bias with loads of drape and curve to create the pleats when buttoned. What a little miracle that stitch pattern and foot are. I think all that makes it more professional. Definitely looks really nice and polished. That skirt is completely FABULOUS. At first I did think it was the skirt from Stitches. But this one has a lot more going for it. You are such an inspiration to a newbie seamster like myself. I think that you will really enjoy the versatility that this CMS can offer you. Thanks for the layout so I could see how it does what it does. Thanks for showing us the construction. I was lusting after the Stitch skirt but I think I like this one more. I hope you like your new virtual home. I was thinking about making the stitches one until I saw this. now I have to find that magazine. I love the buttons and the draping folds. My sister gave me a hand me down jacket that would go great with some current Anthro pants that look like this. You could sew on extra length and hide the seam in a cuff. Went back yesterday and it was gone. Could not remember new site name. But I also wanted to let you know that I nominated you for a Kreativ Blogger award. I am thinking this button might be too noticeable and become a design feature where I might not want them to be.com to post a comment to your blog. You are commenting using your Twitter account. I never really thought I would want to. I managed to purchase most of the Singer Sewing Reference Library in one fell swoop a couple years ago.I like the way you write your blog. It works with WordPress and with folks on Haloscan. Normally I love something because of the fit and fabric. Not often is it the design that makes me giddy. The wrap over piece is cut on the bias with loads of drape and curve to create the pleats when buttoned. What a little miracle that stitch pattern and foot are. I think all that makes it more professional. Definitely looks really nice and polished. That skirt is completely FABULOUS. At first I did think it was the skirt from Stitches. But this one has a lot more going for it. You are such an inspiration to a newbie seamster like myself. I think that you will really enjoy the versatility that this CMS can offer you. Thanks for the layout so I could see how it does what it does. Thanks for showing us the construction. I was lusting after the Stitch skirt but I think I like this one more. I hope you like your new virtual home. I was thinking about making the stitches one until I saw this. now I have to find that magazine. I love the buttons and the draping folds. My sister gave me a hand me down jacket that would go great with some current Anthro pants that look like this. You could sew on extra length and hide the seam in a cuff. Went back yesterday and it was gone. Could not remember new site name. But I also wanted to let you know that I nominated you for a Kreativ Blogger award.com to post a comment to your blog. You are commenting using your Twitter account. I never really thought I would want to. I managed to purchase most of the Singer Sewing Reference Library in one fell swoop a couple years ago.I like the way you write your blog. I am thinking this button might be too noticeable and become a design feature where I might not want them to be.I like the way you write your blog.